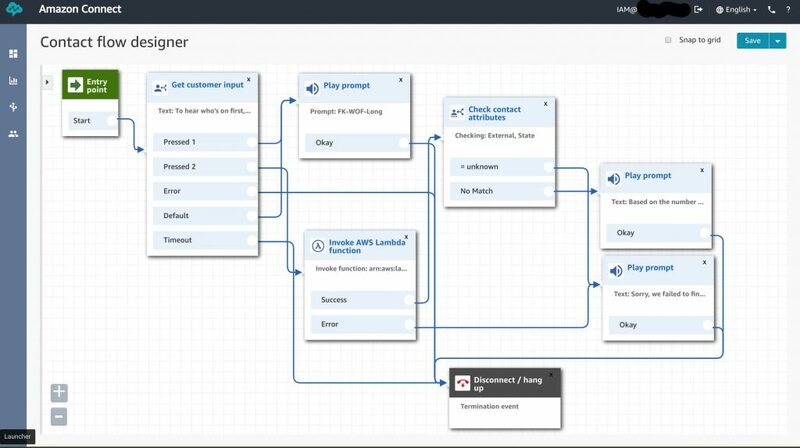 Amazon Connect is the AWS answer to costly contact center telephony platforms. There’s no upfront costs and overall usage is EXTREMELY cheap when compared to legacy telephony platforms – you essentially just pay per minute. I wanted to play with this a bit so I setup an instance and created a simple script to place outbound calls which will allow the call recipient to choose from hearing Abbott and Costello’s famous “Who’s on first?” bit or running their call through a sample Lambda script to identify their state (call 1-571-327-3066 for a demo, minus the outbound experience). Real-world use cases for this could automating calls to remind customers of upcoming appointments, notifying a group of an emergency situation, creating a “Don’t call us, we’ll call you!” customer service setup (so that you don’t have to expose your company’s phone number), scheduling wake-up calls, etc. This assumes you already have your Amazon Connect instance setup with a single number claimed. If not, this takes ~5 minutes to do. In order to interact with Connect outside of the Connect console, you have to add an approved origin. From the AWS console, select “Application Integration” and add the domain which will house our script (from step three below). Like all other API interactions, you’ll need credentials. To do this, I create a temporary IAM user that has the AmazonConnectFullAccess policy attached. The next thing you’ll need to do is get your instance ID, contact flow ID, and queue ID. Connect could make this a bit easier but it’s still simple to locate. Getting your instance ID: Navigate to the Connect page in the AWS console and on the “Overview” page, you’ll see your instance ARN. It’s formatted similar to “arn:aws:connect:us-west-2:99999999instance/”. Your instance ID is after the “…instance/” portion. This is also in the queue and contact flow ARNs. Getting your contact flow and queue IDs: From the Connect console, navigate to the contact flow and queue ID you want to use. On both pages, you’ll see “Show additional queue information”. On click, this will display the ARN. The tail (after “…/queue/” or “…/contact-flow/” of the ARNs contain your IDs. These both also contain your instance ID. 'QueueId' => '<yourConnectQueueId>', // Use either QueueId OR SourcePhoneNumber. SourcePhoneNumber must be claimed in your Connect instnace. The phone numbers must be formatted in E.164 format. The US, for example, would be +15555555555.